Including plants in your aquarium is not just a matter of making it more decorative; aquatic vegetation plays a key role in helping to maintain a well-balanced environment with good water conditions. As with any of the core elements in the aquarium, the planting scheme needs to be carefully planned if it is to be successful. Bear in mind that, just as when gardening on dry land, it will take time for the plants to become established in a new set-up. In some circumstances, living plants are not recommended, however, and you may decide to incorporate plastic substitutes instead. Real, living plants are almost the lungs of the aquarium; without them, management of the environmental balance may prove more problematic. 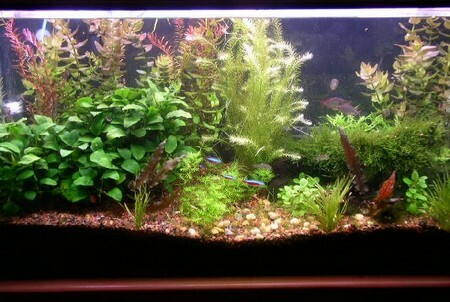 Plants help to oxygenate the water, which is of vital benefit to the fish. During the hours of daylight, plants convert the carbon dioxide produced by the fish to oxygen; if you look carefully, you may notice streams of tiny bubbles of gas rising from the leaves to the surface. This conversion of gas forms part of photosynthesis, the process that enables plants to make their own food, using the energy of sunlight, and creates oxygen as a by-product. During the hours of darkness, however, both plants and plants provide oxygen and food fish use up the oxygen for respiration, releasing carbon dioxide back into the water. Illumination is therefore vital for aquarium plants, since if they are kept in relative darkness, they will die and water quality will also deteriorate. Never place an aquarium in strong sunlight, but make sure that the lighting is of the correct wavelength, approximating to that of natural light; obviously, with plastic plants, lighting is of no direct significance. The other key role played by plants is in the nitrogen cycle. The fish’s waste, in the form of ammonia, is broken down by beneficial bacteria first to less toxic nitrite and then to nitrate. High nitrate levels are not recommended, particularly in aquaria for fish that naturally inhabit flowing rather than relatively stagnant stretches of water. Aquatic plants help to lower the level of nitrate, by using it as a fertilizer to assist growth. In aquaria without living plants, it is more important to make regular partial water changes to dilute the nitrate level. In addition, there is more likely to be a problem with excess algae, microscopic plants that may be present in the water or introduced with new fish. Algae multiply very rapidly, often spreading onto the glass as well as decor in the aquarium, including the leaves of plastic plants, since they face no competition for the nutrients dissolved in the water. If you intend including real plants in your aquarium, then you must consider the substrate carefully, because this is where most of the plants will be placed. Although aquatic plants absorb nutrients through their leaves rather than via their roots, a suitable substrate can encourage healthy root growth. You may obtain special baked clay gravel containing trace elements for this purpose, although ordinary gravel is generally suitable. It is a good idea to draw up a rough planting guide for the aquarium at the outset, which also incorporates other features such as rockwork and bogwood. When buying plants, check their potential eventual size; some aquarium plants can start to dominate a tank if the conditions are ideal for them. Another option is to buy a group of plants specially intended for an aquarium of a particular size; these collections are also often better value than buying several plants individually. A large, upright plant should make a good centrepiece, while other bushier plants of similar size can be placed at the back and around the sides; these help to soften the rigid shape of the tank and also afford hiding-places for fish. It is usual to space out smaller plants (no more than about 10cm/4in tall) around the foreground, making sure that there is plenty of clear space so you can see the fish properly. You can also encourage some plants such as Java fern (Microsorium pteropus) to grow on decor in the aquarium, softening the outline of rockwork for example, and helping to create a more natural appearance. 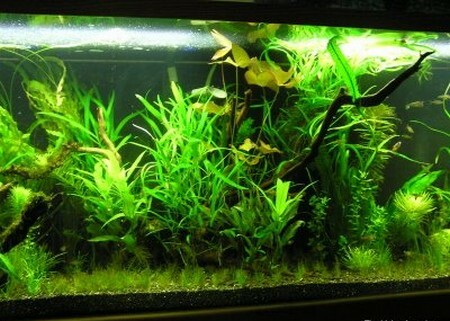 If you are housing any fish that prefer low lighting, include some floating plants at the surface to diffuse the light. These plants also serve to provide a sense of security for the fish, which is particularly important for surface-dwelling species; they instinctively avoid predators by seeking out the spreading leaves of plants for cover to make themselves less visible.